Amalgamated Bank is a blip compared with banking behemoths Citigroup Inc., JPMorgan Chase & Co. and Wells Fargo & Co. — a midsized outfit with a sliver of their assets. But the institution, founded by union workers in 1923 and based in New York, is carving out a niche as the go-to bank for environmentalists, who say they're drawn to its progressive legacy and climate policies. Heavy hitters like the Sierra Club and League of Conservation Voters bank with Amalgamated. So do Climate Hawks Vote and the Sunrise Movement, a youth-driven group that became a customer this year. "It has a history of being a progressive bank with connections to social movements that share our values," Evan Weber, fundraising and political director for Sunrise, said by email. "[Its] portfolio of investments aligns with our mission as a group working towards climate justice." Amalgamated, with about $40 billion in custody and investment assets under management, files resolutions on climate change to prod companies to lower their carbon footprints. It has pledged to withhold financing for fossil fuel infrastructure projects. And in June, it unveiled what it calls a "turnkey" investment portfolio free of fossil fuels. The 95-year-old firm is not alone in offering these products, but it stands out as a different kind of bank. It has become involved in political fights that other institutions tend to avoid, including on wages, workers' rights and climate change. It even looks different: None of its employees was spotted with a necktie the day E&E News visited its Washington branch on K Street. 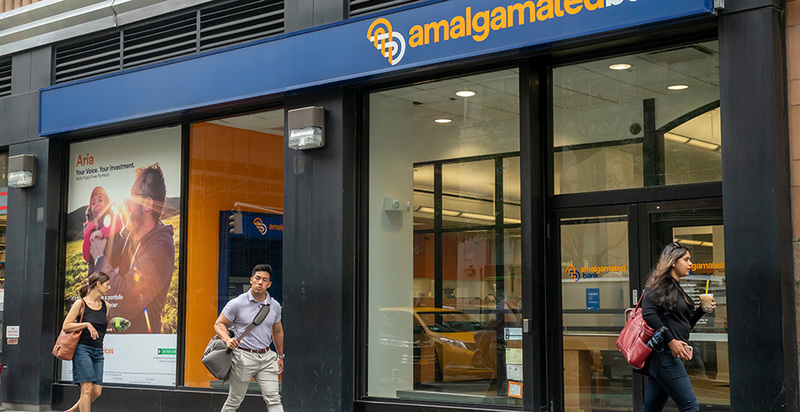 "There is an increasing sense of where you bank matters," Ivan Frishberg, Amalgamated's sustainability banking chief, said in an interview in his office. "Your money goes and spends the night somewhere; what it does when it's there actually matters to you, especially in an increasingly fraught political environment." Amalgamated is more outspoken than a lot of its peers, Frishberg said. "They don't wear their politics on their sleeve as much as we do," he said. "We're an active player." Before joining the bank, Frishberg was managing state environmental campaigns focused on implementing the Clean Power Plan, former President Obama's key domestic program to cut greenhouse gas emissions. A bottle from the climate summit held in California earlier this month sat on a side table behind his desk chair. He'd just returned a few days before. "For me, it's all about sustainability and climate and the environment," he said. New York City textile workers created the bank in 1923, pooling their money into a union-owned collective. The Amalgamated Clothing Workers of America ran the bank in the early years, led by prominent labor organizer Sidney Hillman. Those roots hold: Amalgamated remains the largest union-owned bank in the United States. An affiliate of the Service Employees International Union controls a majority of Amalgamated, and its clients include the American Federation of State, County and Municipal Employees, the country's largest public-sector union, and the Democratic National Committee, according to the bank. Federal campaign finance records show that thousands of transactions flowed through Amalgamated from a diverse set of left-leaning political groups during the current election cycle. These include mainstream institutions like the DNC and the Democratic Senatorial Campaign Committee, along with some of the party's biggest super political action committees: Majority Forward, American Bridge 21st Century and NextGen America. Further to the left, the Democratic Socialists of America PAC banks with Amalgamated, as well. Committees for prominent politicians like Sen. Kirsten Gillibrand (D-N.Y.) and Arizona Senate candidate Kyrsten Sinema (D) use the bank for their campaign funds. Frishberg said Amalgamated is committed to "fully addressing climate risk in our portfolio," which draws business from green groups. But its history of being unionized and staunch support for labor mean its clients include groups like the Laborers' International Union of North America (LIUNA) PAC, which represents, among others, a broad range of energy industry unions. LIUNA's website states that its members "are involved in many aspects of the production and transmission of oil, and natural gas." The group backs climate legislation to reduce carbon emissions but maintains support for an all-of-the-above energy approach — which includes major pipeline expansion. This divide between environmentalists and unions rattled the DNC this summer. In June, the DNC passed a measure banning money from PACs linked to oil, gas and coal corporations. Two months later, the committee reversed its decision, in part due to pressure from labor interests representing energy industry workers. Sometimes the bank's clients can clash over fossil fuel investments. For green groups, divestment is a principal concern. For others, it may be one competing good among many or, for some unions, a move they actively oppose. Frishberg played down any tension among clients, such as the DNC and Sunrise, an advocate of the fossil fuel ban. A local International Brotherhood of Electrical Workers shop installed solar panels on the roof of a New York City Amalgamated branch in January 2017. Sustainable finance has boomed in recent years. Banks increasingly view climate change as a financial threat rather than just an environmental nuisance. Shareholder resolutions on climate dominate the conversation at annual meetings for large corporations. And investors are flocking to specialty investment houses. "Our assets have increased dramatically," said Kyle Kempf, a spokesman for Green Century Capital Management, which has $570 million in assets under management. In an email, he quantified just how dramatically: 435 percent between September 2012 and October 2017. Mindy Lubber, president of the advocacy group Ceres, said the public is savvy in its banking choices. And although she said money is likely the primary factor behind which bank a customer chooses, it's not necessarily the only one. "Consumers can walk and chew gum at the same time," she said. Frishberg credited another factor for increased interest: the anti-Trump bump. "People want to do something," he said. "You guys saw it in the media cycle: Everybody sort of becomes a subscriber to The New York Times all of a sudden, right? So newspaper subscriptions are up because they feel like that's doing something," he said. "In a lot of ways, banking was a part of that, too. Being with a values-aligned bank was a thing that you do."